It's Thanksgiving in America this week and Slots Capital Casino is offering a 300% deposit bonus to give players some extra cash to play with over the holiday. Beginning on Thanksgiving Day and continuing until the end of the monoth they'll give you up to $1200 in bonus cash! Slots Capital doesn't just have slots. They have dozens of slot games from Rival Gaming. But they also have table games, like Blackjack and Roulette. 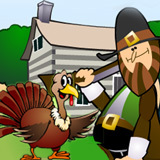 Over the Thanksgiving holiday, the Gobblers Gold slot is bound to be one of the most popular. With Pilgrims, pumpkins and turkeys spinning on its reels, Gobblers Gold takes us back to the very first Thanksgiving when settlers gave thanks for their first harvest in the New World. It has two bonus features. Three or more Pioneer symbols trigger up to 100 free spins with all wins tripled. If you hit three or more Mayflower symbols appear, all symbols turn to Pumpkins. You then choose one of them to reveal an instant prize. Last month Slots Capital, which welcomes players from anywhere in the world, launched its new vampire-themed Dark Hearts slot. You can still claim 50 free spins until the end of the month. Details about this introductory bonus and other current casino bonuses are available at http://www.slotscapital.lv/promotions/bonuses.